The Qt Quick Item as Texture example shows how to use other Qt Quick items as a texture source for Qt Canvas3D textures. text: "X Rot:" + (canvas3d.xRotAnim | 0) + "\n"
+ "Y Rot:" + (canvas3d.yRotAnim | 0) + "\n"
+ "Z Rot:" + (canvas3d.zRotAnim | 0) + "\n"
We want to use the above Rectangle as the texture on our 3D cube. As a Rectangle item doesn't implement QQuickItem::textureProvider() by itself, we make it layered by setting the layer.enabled property to true. Note: The method of creating the texture from a Qt Quick item differs from how one would create texture from an HTML item in WebGL API. 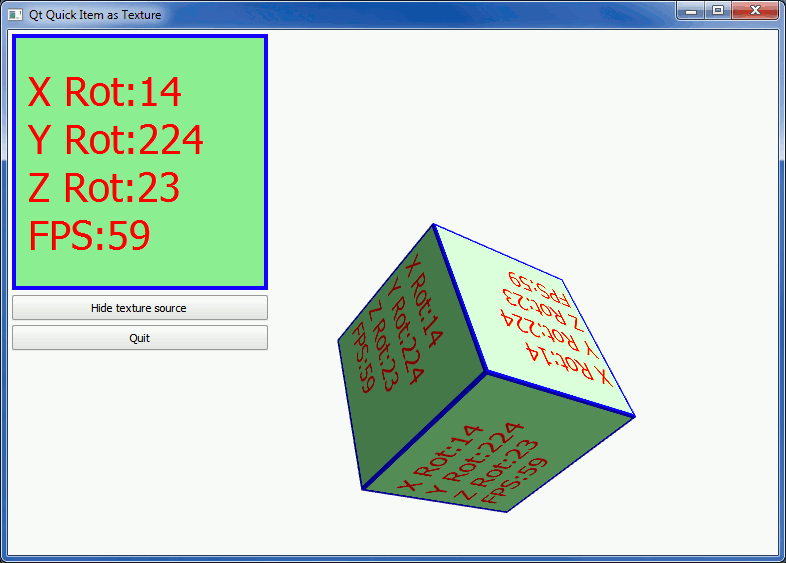 Textures created with QTCANVAS3D_texture_provider extension support automatic live updates, without having to call textureImage2D each frame to re-upload fresh texture data from the item.